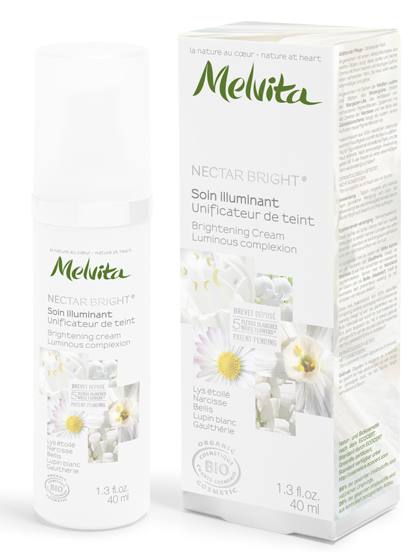 If you’re after a more even complexion, you’ll be happy to know that a new organic brightening range called Nectar Bright from Melvita is launching this May, designed to brighten the skin and tackle pigmentation . The key to its efficiency is the use of a formula that combines five white flowers in its formulation: wintergreen, narcissus, bellis, white lupin and white seal lily – all of which hide in the sun. The products work by exfoliating and encouraging an even tone as well as by arresting the process that leads to hyperpigmentation and by helping protect the skin against over production of melanin. I tried the Brightening exfoliation mask and loved how my skin felt afterwards. To use, you apply it on your face, avoiding your eye area, and leave it on for 5 to 10 minutes, after which you can massage it in (it’s a lovely grainy texture). Finally, you can rinse it off with plenty of water. You can use this mask 2 to 3 times a week. As with all Melvita products, I found this mask to feel wonderful on my skin – the scent is fresh and clean and the quality of the ingredients speak for themselves. A great introduction to any skin routine in need of a boost. The Nectar Bright Collection includes a Brightening Essence (£39), a Brightening Cream (£36), a UV Shield Sunscreen (£25), and a Brightening Exfoliation Mask (£27). For more information go to www.ukmelvita.com. This entry was posted in Skincare and tagged flower complex, hyperpigmentation, Melvita, nectar Bright, organic, UV radiation. Bookmark the permalink.